Cantilever bridges normally use pairs of cantilevers back to back with a short beam bridge in between the cantilevers. Modern motorways have cantilever bridges stretching across them, they have a cantilever coming out from each side and a beam bridge in between them. 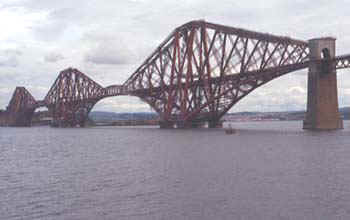 The photograph above is of one of the greatest cantilever bridges the Forth Bridge. The bridge was completed in 1964 and has a main span of 3,300 feet crossing the River Forth in Scotland. The intentions for the bridge was that it would carry a railway engine and carriages up to 260 metres from the nearest support which at the time was quite an ambitious project. From the image it clear that the huge pillars take up the compression which are held up by the narrow top members. Attached to these are the complicated struts and cross bracing which withstand the forces causing buckling and twisting. The outer cantilevers have counterweights at the ends to maintain balance. The bridge was designed and built by Benjamin Baker in the late 1880's and was one of the first cantilever bridges to be constructed. This diagram shows a cantilever bridge supporting a load. 1. Name two basic types of bridges and explain with drawings and notes how each one carries a load. In your answer you need to explain where the load forces act and where the resisting forces respond? 2. Research another Cantilever bridge in a different part of the world. Compare this bridge with the Forth Bridge noting the differences in size, types of metals used and the amount of traffic that both are expected to carry? You may wish to use the internet to research this question and present your answer in a word document?